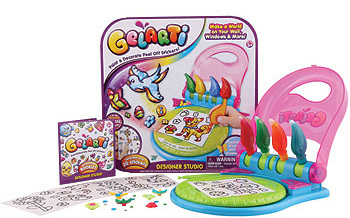 _____For the budding interior designer, the Gelarti Designer Studio is the perfect gift. This set allows your child to create removable stickers that can be displayed on the walls or windows without leaving any permanent marks. The set comes with six sticker sheets, so your child will have many stickers to design and use. It also includes four paint pens for colouring the stickers. It also comes with a tool to help you put gems on the stickers as well as 12 gems to use. There's also a tool to create a marbling effect on the stickers. No design is complete without a little sparkle and this set comes with glitter to complete the look. There are also six 3D accessories you can add to the stickers. Consumers rave about the fun their children have designing stickers and placing them all over the walls and windows without creating any damage to them. They also warn that it's important to follow the directions and give the stickers enough time to dry before handling them. The Gelarti Designer Studio provides a place for your child to store the paint pens and a surface to place the stickers on for painting. The studio rotates so that they can get to a different part of the sticker without having to handle the wet paint. This is a basic set to get your child started with Gelarti products. You'll also find many sets that have different themes for the stickers and accessories. They can all be used with the studio and can enhance the number of projects your child can create. Be careful as you may find that you get addicted to Gelarti as well! Some parents report that they had as much fun as their child when it came to creating the removable stickers. This kit is fun for all ages and gives you a great excuse to find your inner child. If your child is a creative genius, this is a great gift to encourage creativity and fun with crafts. It's also a great way for your child to display art work without sticking anything permanent to the walls that could remove paint or damage surfaces. This all in one kit comes with everything you need to completely finish all the stickers in the kit. It comes with a generous amount of paint and you may find that you don't use all of it in completing all of the stickers. With this kit your child will become a true interior designer making accessories for his or her room. The Gelarti Designer Studio is a great Christmas gift to get your child started with this type of art work.